The Curse of the Billy Goat was a sports-related curse supposedly placed on the Chicago Cubs Major League Baseball franchise in 1945 by Billy Goat Tavern owner William Sianis that lasted in a 71-year period from 1945 to 2016. Because the odor of his pet goat, named Murphy, was bothering other fans, Sianis was asked to leave Wrigley Field, the Cubs' home ballpark, during game 4 of the 1945 World Series. Outraged, Sianis allegedly declared, "Them Cubs, they ain't gonna win no more," which had been interpreted to mean that either the Cubs would never win another National League (NL) pennant, or that they would never again win a World Series. The Cubs lost the 1945 World Series to the Detroit Tigers, and did not win a World Series championship again until 2016. After the incident with Sianis and Murphy, the Cubs did not play in the World Series for the next 71 years until, on the 46th anniversary of Billy Sianis' death, they defeated the Los Angeles Dodgers 5–0 in game 6 of the 2016 National League Championship Series to win the NL pennant. The Cubs defeated the American League (AL) champion Cleveland Indians 8–7 in game 7 (which lasted 10 innings) to win the 2016 World Series, thus ending the curse. Whatever the truth, the Cubs were up two games to one in the 1945 Series, but ended up losing Game 4, as well as the best-of-seven series, four games to three. The curse was immortalized in newspaper columns over the years, particularly by syndicated columnist Mike Royko. The curse gained widespread attention during the 2003 postseason, when Fox television commentators played it up during the Cubs-Marlins matchup in the National League Championship Series (NLCS). According to an account in the Chicago Sun of October 7, 1945, the goat was turned away at the gate, and Sianis left the goat tied to a stake in a parking lot and went into the game alone. There was mention of a lawsuit that day, but no mention of a curse. Some believe that the curse actually goes back to 1908, the last time the Cubs won the World Series, due to the 'underhanded' way the Cubs advanced to that year's World Series, which 'angered' the baseball gods.Between that 1908 triumph, which was the Cubs' second world championship (they'd also won the Series in 1907 to become baseball's first back-to-back winners as well as the first franchise to appear in three consecutive World Series), and 1945, the first year of the alleged Billy Goat curse, the Cubs won the National League pennant six times but failed to win the Series: in 1910, in 1918 (won by the Boston Red Sox who themselves would soon become victims of an alleged baseball curse and not win another Series for 86 years), in 1929, in 1932 (known for Babe Ruth's called shot at Wrigley Field), in 1935 (a re-match of the 1908 series against the Detroit Tigers, with the Tigers winning this time, their first Series triumph in five appearances dating back to the early 1900s), and in 1938. On September 9, 1969, at Shea Stadium, the Cubs played the New York Mets in a critical pennant race game. A stray black cat walked between Cubs captain Ron Santo, who was on deck, and the Cubs dugout. The Mets would pull ahead of the Cubs in that series and eventually win the 1969 World Series. In 1984, the Cubs’ postseason appearance was dashed by the San Diego Padres. The Cubs were victorious in the first two games of the best-of-five series. However, in game five, first baseman Leon Durham let a ground ball get past his allegedly wet glove in the bottom of the seventh inning. The Padres went on to score four runs to win the game and the series. Bill Buckner played for the Chicago Cubs for seven seasons before being traded to the Boston Red Sox halfway through the 1984 season. The Red Sox were at the time also considered a cursed franchise, and had not won a World Series since 1918 - when, coincidentally, they had beaten the Cubs. Buckner and the Red Sox advanced to the 1986 World Series against the New York Mets, and took a 3–2 series lead coming into Game 6. On October 25, 1986, in one of the most famous baseball errors of all time, Buckner allowed a ball to pass between his legs at first base, allowing the Mets to score the winning run in the 10th inning and win Game 6. Later analysis of a photograph of Buckner walking off the field after his blooper showed that he had been wearing a Cubs batting glove under his glove at the moment he committed his error. On October 14, 2003, in the eighth inning of Game 6 of the National League Championship Series (NLCS), with Chicago ahead 3–0 and holding a three games to two lead in the best of seven series, several spectators attempted to catch a foul ball off the bat of Marlins second baseman Luis Castillo. One of the fans, Steve Bartman, reached for the ball, deflecting it and disrupting a potential catch by Cubs outfielder Moisés Alou. If Alou had caught the ball, it would have been the second out in the inning and the Cubs would have been just four outs away from winning their first National League pennant since 1945. Instead, the Cubs ended up surrendering eight runs in the inning and losing the game, 8–3. When they were eliminated in the seventh game the next day, the incident was seen as the "first domino" in the turning point of the series. Sianis' goat was named Murphy. In the 2015 National League Championship Series, this was referenced by fans of the New York Mets, who joked that Daniel Murphy, the Mets second baseman, was "not the first GOAT (Greatest of All Time, in reference to Murphy's postseason heroics to that point) named Murphy to keep the Cubs out of the World Series." Prior to his death on October 22, 1970, Billy Sianis himself attempted to lift the curse. Sam Sianis, his nephew, has gone to Wrigley Field with a goat multiple times in attempts to break the curse, including on Opening Day in 1984 and again in 1989, both years in which the Cubs went on to win their division. In 1994 Sam Sianis went again, with a goat, to stop a home losing streak, and in 1998 for the Wild Card tie-breaker game, which the Cubs won. In 2003 (the Chinese zodiac's Year of the Goat), a group of Cubs fans headed to Houston with a billy goat named "Virgil Homer" and attempted to gain entrance to Minute Maid Park, home of the Astros, division rivals of the Cubs at the time. After they were denied entrance, they unfurled a scroll, read a verse and proclaimed they were "reversing the curse." The Cubs won the division that year and then came within five outs of playing in the World Series, but were undone by the Florida Marlins' eight-run rally immediately following the Steve Bartman incident. The Cubs then lost the following game and with it the series. (The Marlins went on to win the World Series against the New York Yankees.) Further salting the wound, the Astros earned their first World Series berth two years later and their crosstown rival the Chicago White Sox won the series. On February 26, 2004, at the Harry Caray Restaurant in downtown Chicago, the Bartman baseball was electrocuted in an attempt to break the curse, leaving nothing but a heap of string behind. In another bizarre twist, it was reported that a butchered goat was hung from the Harry Caray statue on October 3, 2007, to which The Chicago Sun-Times noted: "If the prankster intended to reverse the supposed billy goat curse with the stunt, it doesn't appear to have worked." While the Cubs did win the NL Central division title in 2007 and 2008, they were swept in the first round of the postseason in both years: by the Arizona Diamondbacks in 2007 and the Los Angeles Dodgers in 2008. The elimination by Arizona came on October 6, the same date that the goat appeared at Wrigley Field in 1945. In 2008, a Greek Orthodox priest sought to end the curse during the 2008 playoffs with a spraying of holy water in and around the Cubs dugout to no avail. The act was repeated before the home opener in 2009, this time a goat's butchered head being hung from the statue. The act was futile as the Cubs were eliminated from postseason contention on September 26, 2009. Cubs fans have also brought in priests that have blessed the field, stadium, and dugout. On April 1, 2011, a social enterprise called Reverse The Curse, dedicated to bringing innovations to poverty by giving goats to families in developing countries, was initiated. The goats provide the family with milk, cheese, and alternative income to help lift them out of poverty. Reverse The Curse has expanded into reversing the "curses" that afflict the world's children in education and obesity. On February 25, 2012, a group of five Chicago Cubs fans calling themselves Crack the Curse set out on foot from Mesa, Arizona (home to the Cubs' spring training facilities) to Wrigley Field. They brought along a goat named Wrigley whom they believed would be able to break the Curse of the Billy Goat upon arrival at Wrigley Field. Additionally, they attempted to raise $100,000 for the Fred Hutchinson Cancer Research Center. On April 10, 2013, a severed goat's head was delivered to the Cubs in a possible effort to lift the curse on the team. It was addressed to the club's owner Thomas S. Ricketts. On September 22, 2015, Patrick Bertoletti, Tim Brown, Takeru Kobayashi, Kevin Strahle and Bob Shoudt consumed a 40-pound goat in 13 minutes and 22 seconds at Taco in a Bag restaurant in Chicago. On October 7, 2016, The owners of The Chicago Diner, a local vegetarian eatery near Wrigley Field, teamed up with Farm Sanctuary to try to reverse the Curse of the Billy Goat by displaying posters in the windows at their locations. The posters feature a goat named Peanut who urges Chicagoans to “reverse the curse” by going meat-free. Another factor that may play a role in the curse is the number of players (42 of them are listed below) who won World Series titles after leaving the Cubs (known as the Ex-Cubs Factor). These players include Andy Pafko (who, coincidentally, played in the 1945 World Series as a member of the Cubs), Gene Baker, Smoky Burgess, Don Hoak, Dale Long, Lou Brock (whose first title was in 1964 after a mid-season trade to the St. Louis Cardinals), Lou Johnson, Jim Brewer, Moe Drabowsky, Don Cardwell, Ken Holtzman, Paul Noce, Billy North, Fred Norman, Bill Madlock, Manny Trillo, Greg Gross, Rick Monday, Burt Hooton, Bruce Sutter, Willie Hernández, Milt Wilcox, Joe Niekro, Dennis Eckersley, Joe Carter, Greg Maddux, Joe Girardi (as both a player and a manager), José Vizcaíno, Glenallen Hill (after his second stint with the Cubs; his title came in 2000 after a mid-season trade), Luis Gonzalez, Mike Morgan, Mark Grace, Mark Bellhorn, Bill Mueller, Scott Eyre (whose title came in 2008 after he had been traded from the Cubs during the season), Tom Gordon, Matt Stairs, Jamie Moyer, Mark DeRosa, Mike Fontenot, Ryan Theriot, Ángel Pagán, and, in 2013, Ryan Dempster. Dontrelle Willis and Jon Garland were traded as minor leaguers (coincidentally, the former won a World Series ring with the Marlins team that defeated the Cubs in the 2003 NLCS). Tim Lincecum, who went on to win three World Series titles, was originally drafted by the Cubs, but he did not sign with them. The Chicago Cubs and Cleveland Indians play Game 7 of the 2016 World Series in Cleveland on November 2, 2016. The Cubs won, ending their 108-year losing streak and 71-year-old curse. In 2016, the Cubs won the World Series for the first time since 1908, ending the historic 108 year drought and the "curse." The Cubs ended the 2016 season with a 103–58 (.640) record. It was their first 100-win season since 1935 (100–54, .649), their best since 1910 (104–50, .675), and the sixth 100-win season in franchise history—the others being 1906 (116–36, .763), 1907 (107–45, .704) and 1909 (104–50, .675). The Cubs won their first National League Championship Series (NLCS), their first pennant in 71 years, with a 5–0 shutout against the Los Angeles Dodgers at Wrigley Field on October 22, 2016, the 46th anniversary of Billy Sianis' death. The Cubs beat the Cleveland Indians in the 2016 World Series in seven games after trailing in the series 3-1. They won Game 7 by a score of 8–7 in 10 innings. ↑ Ferraro, Michael X.; Veneziano, John (2007). Numbelivable!. Chicago, Illinois: Triumph Books. p. 119. ISBN 978-1-57243-990-0. ↑ Newman, Mark (February 19, 2015). "Will the Cubs break the Curse of the Billy Goat in the 'Year of the Goat?'". Major League Baseball Advanced Media, LP. Retrieved August 14, 2015. 1 2 "Celebrity Deaths: William Sianis and the Curse of the Billy Goat". Legacy.com. 2010. Retrieved October 22, 2016. ↑ Gurnick, Ken; Muskat, Carrie (October 23, 2016). 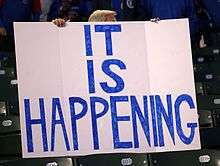 "Wait of the World: Cubs win NL pennant!". Chicago Cubs. Retrieved October 25, 2016. ↑ Bastian, Jordan; Muskat, Carrie (November 2, 2016). "Cubs are heavy wait champions!". Major League Baseball Advanced Media. Retrieved November 3, 2016. ↑ Adam Selzer (1 July 2014). Chronicles of Old Chicago: Exploring the History and Lore of the Windy City. Museyon Inc. p. 156. ISBN 978-0-9846334-8-7. ↑ Avila, Michael (September 2, 2010). "Are the Chicago Cubs Really Cursed?". LiveScience. Retrieved August 14, 2015. ↑ Major League Baseball on Fox: Game 6 of 2003 National League Championship Series (television). Fox Sports. October 14, 2003. ↑ Doolittle, Bradford (November 3, 2016). "From 1908 until now: Cubs' run of heartache finally ends". ESPN.com. Retrieved November 12, 2016. ↑ "On Friday the 13th, let's revisit the Cubs' 'Black Cat Game'". Major League Baseball Advanced Media. May 13, 2016. Retrieved November 3, 2016. ↑ Mitchell, Fred (May 4, 2012). "Durham doesn't think much of error in '84 playoffs". Chicago Tribune. Retrieved November 3, 2016. ↑ "Photo Reveals Double Curse in 1986". ESPN.com. Retrieved October 6, 2016. ↑ "Baseball fan feels Chicago's fury". BBC News. bbcnews.com. October 17, 2003. Retrieved July 9, 2008. ↑ Berg, Ted (October 18, 2015). "The Cubs' infamously exiled billy goat was also named 'Murphy'". USA Today. Retrieved July 3, 2016. ↑ "The Billy Goat Curse". The World-Famous Billy Goat Tavern. August 14, 2015. Retrieved August 14, 2015. ↑ "Woe is us ; A look at the curses". USA Today. October 16, 2004. p. C2. ↑ Toomey, Shamus (October 6, 2007). "Dead goat hung from Harry statue". Chicago Sun-Times. ↑ Svrluga, Barry (October 7, 2007). "Castilla Back With Rockies In New Role". Washington Post. p. D6. ↑ Priest Blesses Chicago Cubs Dugout With Holy Water. YouTube. 20 January 2009. ↑ Sullivan, Paul (September 27, 2009). "CUBS 6, GIANTS 2; Eliminating the negative; Late hot streak minus Bradley is positive, but Cards clinch anyway". Chicago Tribune. p. 9. ↑ "Reverse the Curse". Reverse The Curse Chicago. August 14, 2015. Retrieved August 14, 2015. ↑ news, Tulsa World: Tulsa; sports; business; entertainment; weather. "Tulsa World". Retrieved 4 November 2016. ↑ Brumfield, Ben (April 11, 2013). 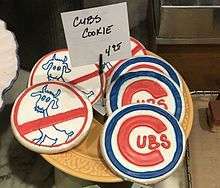 "Severed goat's head at Wrigley Field mirrors curse on Chicago Cubs". CNN. Retrieved October 26, 2015. ↑ Fox News (September 24, 2015). "Competitive eaters devour goat meat to break Cubs. However at the end the New York Mets beat the Cubs and loss the NL championship in 2015 (which later the Kansas City Royals win the World seeies of 2015.curse". New York Post. Retrieved October 26, 2015. ↑ "Farm Sanctuary". www.farmsanctuary.org. Retrieved 2016-10-27. ↑ "2003 First-Year Player Draft Tracker". Major League Baseball Advanced Media, LP. June 4, 2003. Retrieved August 14, 2015. Jack Bales, "A So-Called Curse," WrigleyIvy.com.